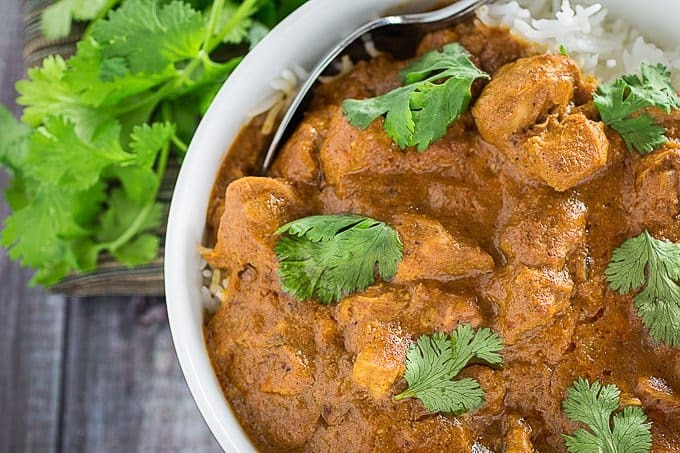 Slow Cooker Butter Chicken is a really easy version of this savory dish. 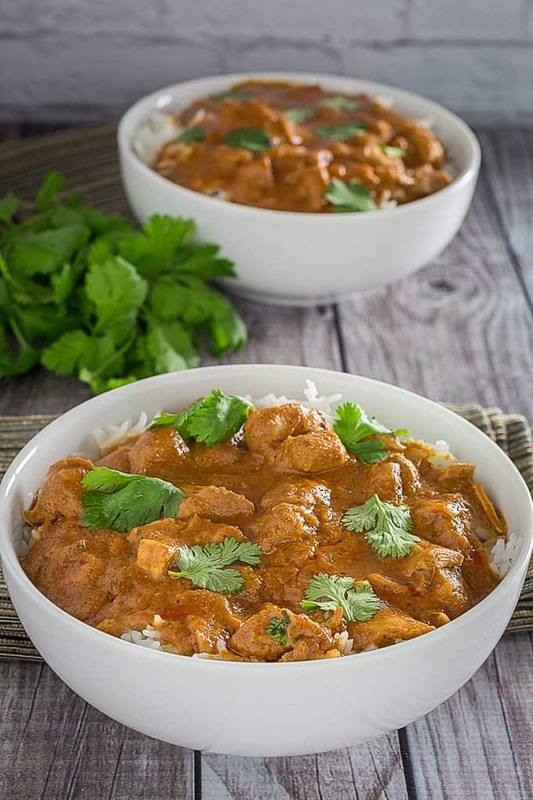 Tender chicken slowly simmered in a mild yogurt and butter curry sauce with garlic, ginger, onions, coriander, and garam masala. Serve over basmati rice and top with fresh cilantro. 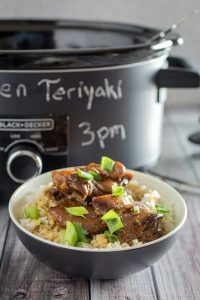 Have I told you lately how much I love my slow cooker? Well, I do. 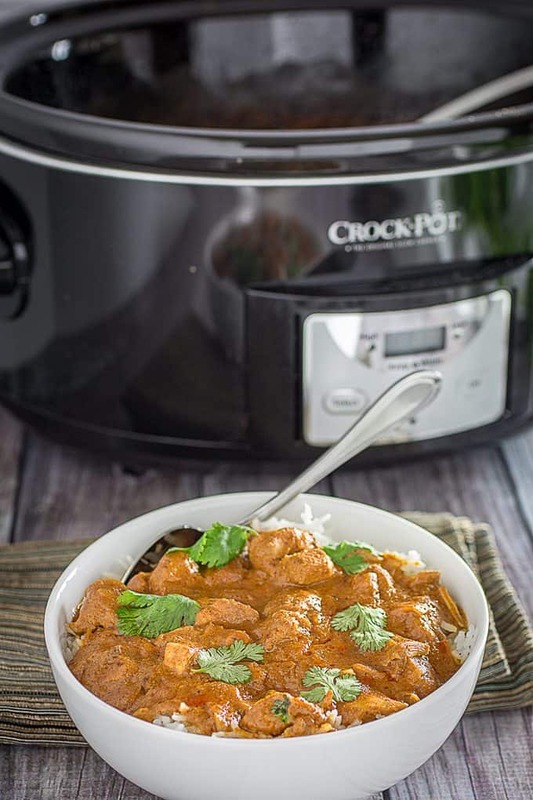 I love it so much, that if my stove broke in half tomorrow, I’d only be slightly sad knowing that I have something like this slow cooker butter chicken waiting for me. No mess, no fuss, no stove full of dishes to clean up after. 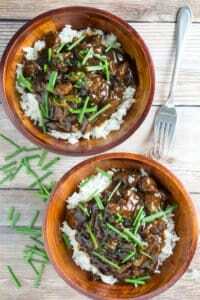 Just one slow cooker simmering your dinner to perfection. Not to mention, I can set this up the night before, and just plug in the slow cooker before I go about my busy day. When I’m home in the evening, dinner is there waiting for me. Delicious, delicious dinner. Oh, yes, I’m definitely on board with this plan. Don’t let the name of this dish fool you. It’s not really a butter sauce, like the name suggests. There’s actually only 2 tbsp butter in this entire dish, which really isn’t that much when you think about how many servings there are here. 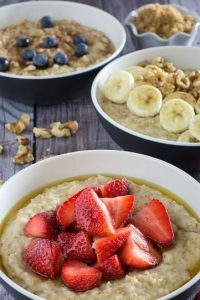 I made mine with fat-free yogurt and half and half, to cut down on some of the calories and overall heaviness of the dish. 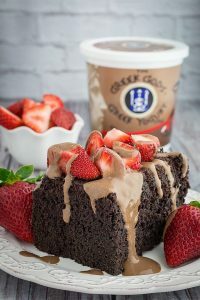 But if you want to make this the classic way (you know, besides for the whole slow cooker thing, because that doesn’t count), you’d want to use heavy cream and full fat yogurt. Personally, I don’t think it makes a big enough difference to have to go all out. But everyone has their own personal preferences. Indian food is kind of staple in my house. Andrew and I both love going out to dinner, but I stand by the idea that home cooked meals usually taste better, are better for you, and make your home just smell comforting and amazing. Unfortunately, I can’t always deliver a home cooked meal every night. We both work full-time, work on the blog, Andrew works on his photography, and need to dedicate what precious time we have to our ongoing Netflix marathon of Grimm. Ok, maybe we don’t have to do that, but sometimes you just need to unwind at the end of the day. Walking into my home at the end of a long day and having it smell like I’ve already spent hours in the kitchen preparing dinner? Priceless. I feel like I’m both taking care of my family, and multitasking at the same time. And it requires so little actual effort, that I almost feel guilty that it tastes so good. Almost. Let’s not get crazy here. I’ve never told you this before, but I grew up in a very spiceless household. I mean, very spiceless. My mother adamantly insists that spices are not really necessary beyond salt and pepper. In fact, the less spices used, the better, because it meant the dish was easier to make. We had the occasional garlic powder, and if we wanted to get really crazy we might have had something like chili powder. You know, on chili night. So when I grew up and realized what I’d been missing out on all these years, I developed an undying love for dishes that required different spices. The more the better, in my opinion. Which is also why I love Indian cuisine so much. I have to brace my spice cabinet before I get down to it, but it’s totally and completely worth it in my opinion. Especially when the end result is a dish like slow cooker butter chicken. 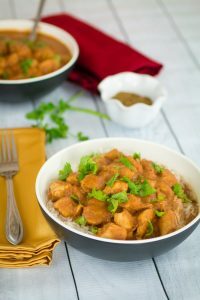 And if you love slow cooker butter chicken, you may also love my slow cooker chicken tikka masala! See, there’s a theme going on here. 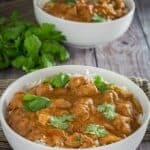 But How Do I Serve Slow Cooker Butter Chicken? 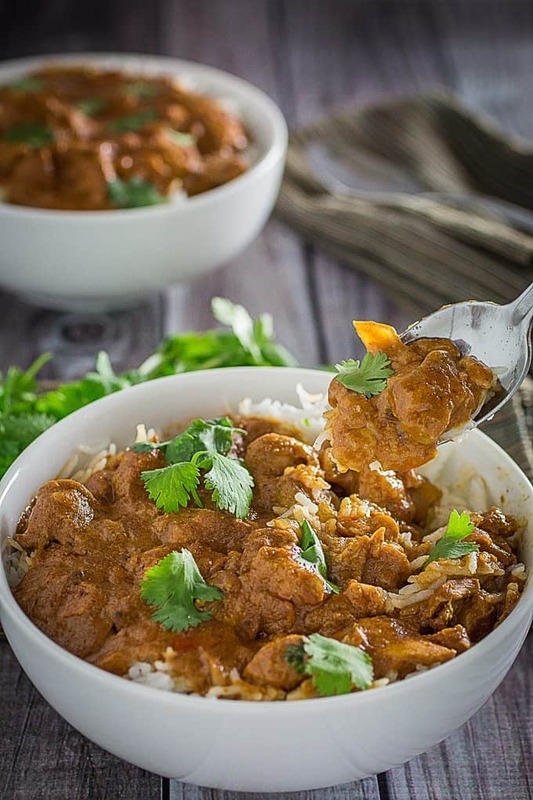 I like to serve slow cooker butter chicken over a bowl of basmati rice. You can use regular rice, too, and it would be good. 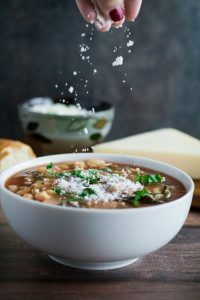 But basmati rice has a deliciously nutty flavor that adds to the overall dish. I also top this with fresh cilantro and sometimes an extra scoop of plain yogurt. You have to be prepared for these things, you know? When I find a good source of paneer down here in Florida, I have plans of tackling a few more of our favorite dishes. Maybe in the slow cooker. Ok, probably in the slow cooker. I mean, I might get inspired to get something going on the stove top. You really never know when inspiration will strike! But it will most likely be in the slow cooker. Because the easier something this delicious is to make, the better. Why make something hard when it can be so, so easy? Add all ingredients except for water and corn starch to slow cooker and stir to combine. Whisk corn starch and water together. 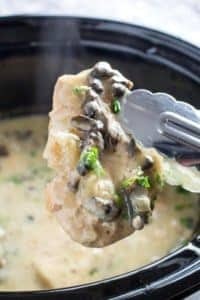 Pour into slow cooker and stir into sauce. Cook on HIGH 4 hours or LOW 6-8 hours, or until chicken is cooked through. 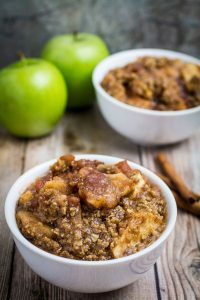 Serve over basmati rice or with gluten free naan. Hi Barbara, Thanks! It’s 2 tbsp corn starch and 1/4 cup water. I’d love it try making fresh paneer! I make mozzarella at home sometimes, and you’re right, when it comes to cheese nothing beats it fresh. Do you have any good tips?